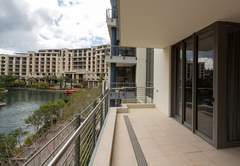 Pembroke 203 is a property providing self catering in V&A Waterfront for up to 6 guests visiting the Atlantic Seaboard region. 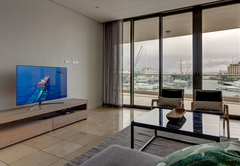 With a clean, modern look and feel, Pembroke 203 is a fabulous apartment that accommodates up to six guests and offers stunning views over the marine waterways of the Victoria & Alfred Waterfront. 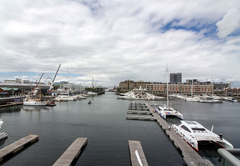 Thanks to its convenient locale, the apartment is ideal for visitors that want to explore the Mother City and be part of the vibe. 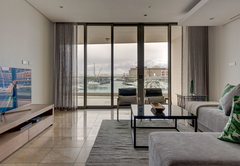 Pembroke 203 Holiday Apartment is 200 square metres, and has three bedrooms and three bathrooms. 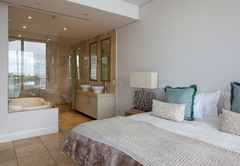 The main bedroom has a King-size bed, and an en-suite bathroom with a bath and shower. 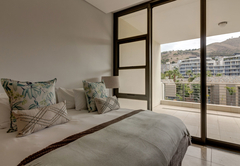 The remaining two bedrooms each have two single beds, and one has an en-suite bathroom with a shower and bath. The third bathroom is separate and has a shower. 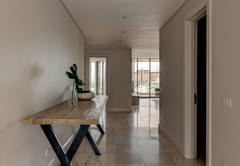 The apartment’s open-plan lounge and dining area is cool and inviting. 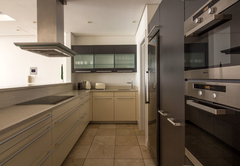 The kitchen is fully equipped with all of the necessary appliances, crockery and cutlery; as well as with a washing machine, tumble dryer, and dishwasher. 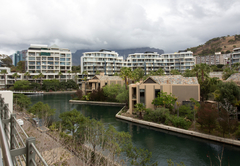 There are two balconies; one overlooking the yacht basin and the other overlooking the canals. 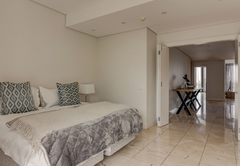 The Pembroke apartment has heated floors, air-conditioning, cable television, satellite, a DVD player, a telephone, and free Wi-Fi. 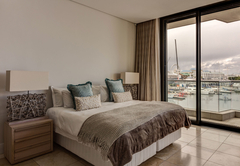 Linen and bath towels are provided to guests, and housekeeping can be arranged on weekdays. 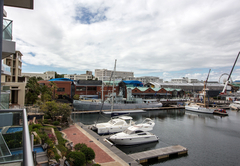 Being in the very heart of one of Africa’s top attractions, the V&A Waterfront, means that Pembroke 203 offers easy access to hundreds of shops, restaurants, speciality stores, markets, convenient amenities, and more. 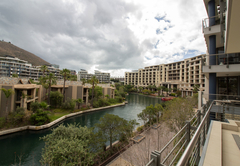 It is only a few minutes’ drive from the city centre and the Cape Town International Convention Centre, and about 20 minutes from the international airport. 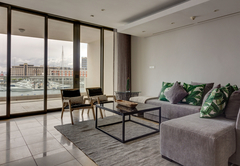 Pembroke 203 has three bedrooms and three bathrooms. 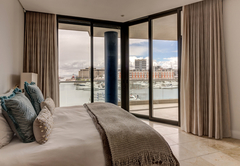 The main bedroom has a King-size bed, and an en-suite bathroom with a bath and shower. 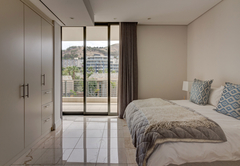 The remaining two bedrooms each have two single beds, and one has an en-suite bathroom with a shower and bath. The third bathroom is separate and has a shower. Response timePembroke 203 typically responds to requests in 5-10 minutes. Child policyThe apartment sleeps up to six adults each and is not suitable for children.